PHOENIX, AZ--(Marketwired - May 19, 2016) - In advance of NRA Show 2016, Heckler Design has introduced WindFall Coaster to provide an elegant solution to the decline in table turn many restaurants have experienced as a result of phone distractions. 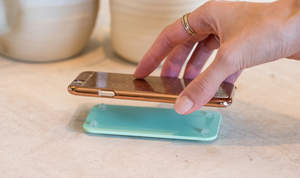 The coaster also provides restaurant owners a way to tastefully encourage diners to stack their phones at meal time and engage in the traditional dining experience. WindFall Coaster is constructed of powder-coated steel and includes soft elastomer corner pegs that lift the phone away from liquid and other tabletop debris, as well as reduce vibration noise when a phone is silenced. Rather than concealing phones in a cardboard box, as some fast-food restaurants have recently offered, the thoughtful design of the commercial-grade WindFall Coaster is something restaurant owners are proud to display on dining tables. By keeping the phone visible and face down, diners stay engaged in the experience, yet won't risk phones being inadvertently thrown away or left behind. "Restaurateurs and chefs have a love/hate relationship with phone use in the restaurant," said Dean Heckler, founder and lead designer at Heckler Design. "Though customer Instagramming while dining is a helpful form of marketing, restaurant phone use has frustrated servers and significantly impacted table turn in recent years. WindFall Coaster was created to give restaurateurs a stylish and polite way to create a much-needed phone etiquette." 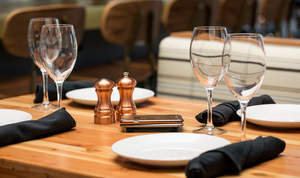 "We love that our guests are sharing their experience at POSH in real time, but we have noticed phone use has added time to the dining experience," said Joshua Hebert, owner and chef at POSH Restaurant in Scottsdale, Ariz. "Being a fine dining restaurant, we're also all about the experience. The fact that WindFall Coaster encourages diners to put the phone down and be fully present in the experience has been a tremendous benefit." WindFall Coaster is intended to be placed in the center of the table to encourage all diners to stack their phones together, and a playful diagram on the bottom of the phone coaster depicts how to use it. WindFall Coaster is part of the popular WindFall product line of hardware designed for restaurant and retail to enable better utilization of tablets and phones in commercial settings. WindFall Coaster is available in a variety of colors, and start at $15 for an individual phone coaster, and $149 for a pack of 12. It is available today at www.HecklerDesign.com. Heckler Design, known for its renowned OneLessDesk, creates beautifully simple, commercial-grade products for design-conscious consumers and businesses. Heckler Design's products currently include office furniture, desk accessories, iPad stands, and point-of-sale hardware. Founded in 2007 and headquartered in Phoenix, Ariz., all of Heckler Design's products are designed by Dean Heckler and made in America. More information is available at www.HecklerDesign.com. The new Heckler Design WindFall Coaster is an elegant solution to phone distractions. Whether at the restaurant dining table or in the boardroom, WindFall Coaster was designed to reduce phone distraction and encourage human interaction.